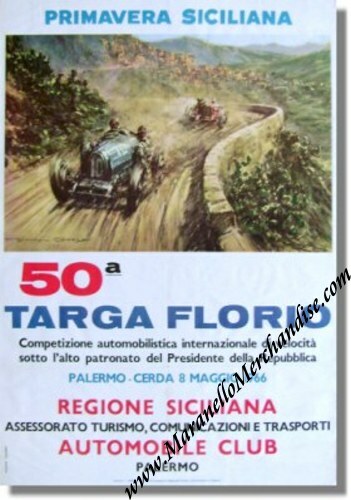 1966 Targa Florio Race Poster - Vintage Original. This is a great VINTAGE poster for the 50th (!) running of the Targa Florio. It shows a great image of a Bugatti being chased by an Alfa Romeo. It is printed on very thin paper but it is in pretty good condition. It has been folded twice (most probably original folds) and has been stored rolled for the last decade or so. The race was won by Willy Mairesse & Herbert Muller in their Porsche 906. The poster measures some 70 x 100 cm or 28 x 40 inches and was printed in Palermo, Sicily (where else? ).